After a brief return to Beaufort Andy, Jane and Rene moved to Amherst (pronounced “AM-erst”) in 1926. Jane knew this part of Victoria well from her travels during the war. Andy became the sexton of Amherst Cemetery in February 1926. Andy was in need of work and the Cemetery Trustees were desperate to find a sexton and grave-digger. The cemetery had been without a permanent sexton since early in 1925, when Mr T Matthews had resigned. Matthews had sought a guarantee of more regular work along with higher remuneration, neither of which the Cemetery Trustees could provide. Matthews’ replacement lasted only a few months before having his employment terminated. Without a sexton the cemetery had become overgrown and overrun with rabbits. There was no-one to dig or tend the graves. 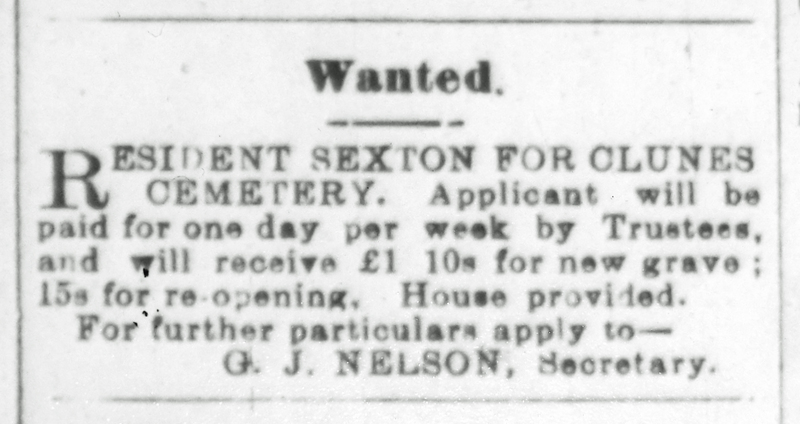 For a considerable period the trustees of the Amherst Cemetery have been without a permanent sexton, and at times have experienced some difficulty in obtaining the services of any person to do the grave digging. Last week a dead end was reached, inasmuch as the trustees were unable to secure anyone to open up a grave. Finally, two of the trustees volunteered to carry out the work, which they did in a satisfactory manner, but they were not anxious to take on the vacant position. The cemetery was not far from the Amherst Hospital and Sanatorium – a 30 minute walk. The “fully equipped and up to date” Sanatorium was regarded by many as Victoria’s foremost institution for the treatment of infectious diseases such as tuberculosis, typhoid fever, scarlet fever, measles and influenza. You might think that Andy would have had plenty of grave-digging work come his way from the hospital, but that was not the case. The Sanatorium was proud of its cure rate – 225 cures from 331 patients in the 12 months to March 1928. Brewster, B. 2003. Amherst District Hospital 1859 to 1933: The Story of a Gold Rush Hospital. Maryborough, Victoria, Australia: Talbot Arts & Historical Museum Inc.
Hockley, A. 1996. ‘History of the Amherst Hospital’. Avoca and District Historical Society Newsletter No. 139 July 1996. The soldier settlers (at) Mount Hutton have had a very (difficult) time … 10 months’ drought … Very little dairying … done for some time, and some … settlers never knew where they (were) going to get the next crust … a lot of settlers ran them(selves) short to feed their horses … Cows … died everywhere. I forgot to mention that … few of the settlers have been in (a) position to pay rates, let alone the (interest) on the loan of £625. Everyone is suffer(ing) … alike. When cream was a good (price) everyone was just starting, and (then) cream was plentiful and the price (came) down to 6d. per lb., – on top of (that) came the drought. If you want to get away from your in-laws, then moving over 1,700 kilometres from one end of the country to the other is definitely one way to do it. By mid 1920 Andy and Jane Duncan were just north of Roma, Queensland, where Andy took up a perpetual lease on the Mt. Hutton returned soldier settlement. Soldier settlement schemes were established by Australia’s state governments to open up land for returning servicemen. In Queensland perpetual lease provisions were that no deposit of rent or survey fee were required up-front, and during the first three years only a peppercorn rent was charged. After the first three years the survey fee and rent increased. Why did Andy apply for the Queensland soldier scheme rather than the Victorian one? Did Mt. Hutton feel closer to his pre-war Broken Hill life than Beaufort? Did he have army mates who encouraged him to join them in Queensland? Did he really want to put some distance between himself and his in-laws? Or did a family connection influence him? Andy’s great-aunt, Jean Murray (nee Stewart), had emigrated to Queensland in 1862, living in Rockhampton and later Ravenswood. Another great-aunt, Mary Taylor (nee Stewart), and great-uncle, John Stewart, followed in 1884. Mary Taylor settled in Georgetown. John Stewart re-established his stonemasonry business and became a city alderman in Brisbane. Andy would have grown up hearing stories of his Stewart relations’ successes in relocating to Queensland. One thing is clear, though: when the Queensland newspaper announced Andy’s successful lease application on 11 February 1920 the Beaufort soldier settlement scheme was still just an idea under discussion. Andy had taken the first chance he got to apply for a land lease. 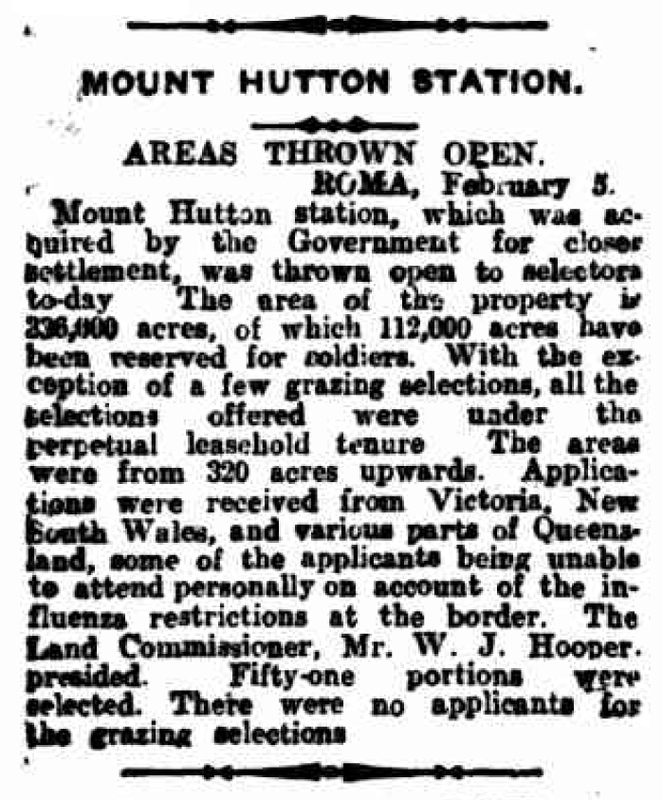 ‘MOUNT HUTTON STATION.’, The Queenslander (Brisbane, Qld. ), 15 February 1919, p. 35. Newspaper article found in Trove and reproduced courtesy of the National Library of Australia. By August 1920 Andy and Jane had moved from Beaufort to Gunnewin. Andy had secured 638 acres, which he named Bonnie Brae Farm. The land was poor, but Andy threw himself into making a go of the lease, establishing a dairy farm. The soldier settlers had a hard time of it. Portion 70 of the Mount Hutton soldier settlement was the location of Andy Duncan’s Bonnie Brae Farm. Image courtesy of the Roma & District Family History Society. Signs of drought were noticeable on the blocks, but the ex-soldiers were found to be battling well against great odds to make a success of their farms. There is hardly a living at dairying at the present time on account of the dry weather and the low price of cream. The Queensland government seemed unaware of the actual situation. The Minister for Lands claimed there had been “very few failures” on the settlement, and rather uncharitably explained that they were “due to the inadaptability of the settlers concerned”. For Andy the struggle with the land was made harder by the shrapnel he carried in his back. It prevented him from horse riding and when the shrapnel moved he had to take to bed. But he was determined to make a success of his farm. Andy’s civic-mindedness was still strong, as was Jane’s. Andy was appointed Secretary of the Gunnewin Bush Nursing Centre and in May 1922 he became a founding member of the Mt. Hutton sub-branch of the Returned Sailors and Soldiers Imperial League. He was appointed secretary and treasurer. Part of his role was to lobby for an increase in the returned soldier loan from an insufficient £625 to a hoped-for £1,000. The League sub-branch also sought State Government assistance to build new facilities at Gunnewin including a School of Arts, library and soldiers’ meeting room. the very serious time through which the settlers were passing, and expressed the hope that eventually the markets would be stabilised so as to give them a fair and reasonable return for their labor, and enable them to win through. His Excellency, in thanking the settlers for their address of welcome, said he believed that the great majority of the returned soldiers would win through. After all, those that went, those that volunteered to undergo the great risks, the exhausting sufferings and the extreme discomforts of war were the best of the land. Some, no doubt were weakened in body and will by what they went through. But he did not believe that this applied to the great majority, and he was sure there were some who were stronger and not weaker for their experiences. It was a new proposition that they had come to here, but that he was sure did not frighten them. Soldiering was a new proposition to most of them, but they made none the worse soldiers for that. They were having a difficult time at the start, but they had a difficult time at the start at Gallipoli and in France, and that did not prevent them winning in the end. He felt sure they would win in the end here. One can only imagine Andy’s feelings as he watched the Governor’s party disappear down the dusty road. The settlers battled on. The School of Arts, library and meeting room were built, along with a recreation hall. The men were prepared to put their own savings towards developing Gunnewin, but there was little money to spare. Fund-raising activities and social events were planned, for community morale and to encourage Roma residents to visit. Jane organised a coin evening and dance at the new Gunnewin hall in October. But fund-raising in an increasingly impoverished community was not easy, and the hall still had not been paid for a year later. The ex-soldiers felt somewhat marginalised and did not want to be perceived as a burden on the Roma community. Andy would have felt this keenly. Andy and Jane had put their all into Bonnie Brae Farm yet there was no improvement in sight. There was no money to pay the increased survey fees and rent that were about to come due. They made the difficult decision to leave. At the start of 1923 they returned to Victoria with their new daughter, Mavis Irene “Rene” Duncan, born 20 June 1922. 1301.0 – Year Book Australia, 1925. 2015. [ONLINE] [Accessed 13 March 2015]. 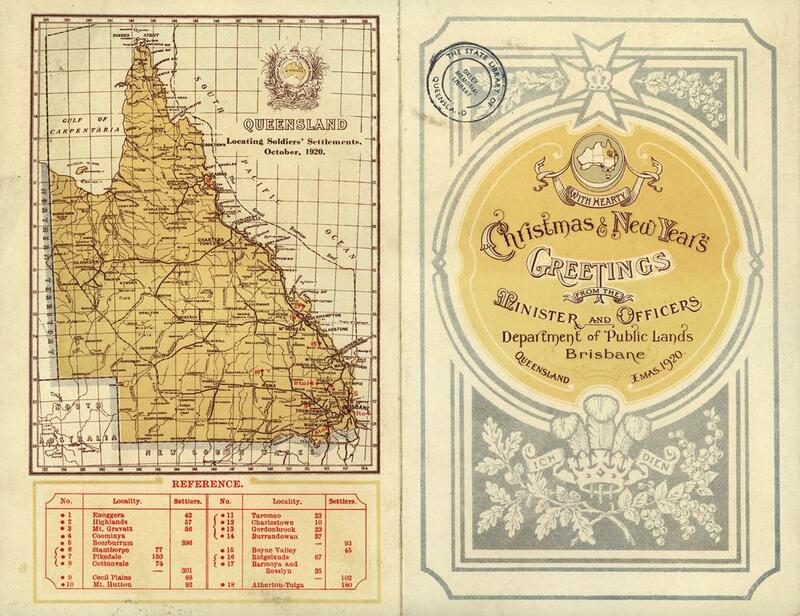 1920 Queensland Brands Directory 1920 – 21, p.562, 670. [ONLINE] Available at http://findmypast.com.au [Accessed 12 May 2013]. 1922 ‘Mt. Hutton Settlement’. Western Star and Roma Advertiser (Toowoomba, Qld. : 1875 – 1948), 15 March, p. 4. [ONLINE] Available at: http://nla.gov.au/nla.news-article98071548 [Accessed 24 December 2013]. 1922 ‘Advertising’.Western Star and Roma Advertiser (Toowoomba, Qld. : 1875 – 1948), 1 April, p. 3. [ONLINE] Available at: http://nla.gov.au/nla.news-article98071796 [Accessed 24 December 2013]. 1922 ‘Mt. Hutton Settlement’. The Brisbane Courier (Qld. : 1864 – 1933), 3 May, p. 8. [ONLINE] Available at: http://nla.gov.au/nla.news-article20524035 [Accessed 10 August 2013]. 1922 ‘Gunnewin’. Western Star and Roma Advertiser (Toowoomba, Qld. : 1875 – 1948), 3 May, p. 2. [ONLINE] Available at: http://nla.gov.au/nla.news-article98186766 [Accessed 24 December 2013]. 1922 ‘Visit of the Governor’. Western Star and Roma Advertiser (Toowoomba, Qld. : 1875 – 1948), 10 May, p. 2 [ONLINE] Available at: http://nla.gov.au/nla.news-article98186836 [Accessed 10 August 2013]. 1922 ‘The Political Situation’.Western Star and Roma Advertiser (Toowoomba, Qld. : 1875 – 1948), 7 October, p. 2. [ONLINE] Available at: http://nla.gov.au/nla.news-article98188945 [Accessed 11 August 2013]. 1922 ‘Alleged Unlawfully Killing a Calf’. Western Star and Roma Advertiser (Toowoomba, Qld. : 1875 – 1948), 15 November, p. 2. [ONLINE] Available at: http://nla.gov.au/nla.news-article98189472 [Accessed 10 August 2013]. 1923 ‘Advertising’. Western Star and Roma Advertiser (Toowoomba, Qld. : 1875 – 1948), 13 October, p. 3. [ONLINE] Available at: http://nla.gov.au/nla.news-article98194153 [Accessed 24 December 2013]. 1924 ‘Soldier Settlers’. Queensland Times (Ipswich) (Qld. : 1909 – 1954), 8 August, p. 6 Edition: DAILY. [ONLINE] Available at: http://nla.gov.au/nla.news-article118577479 [Accessed 25 December 2013].